In this paper I contrast the geometric structure of phenomenal visual space with that of photographic images. I argue that topologically both are two-dimensional and that both involve central projections of scenes being depicted. However, I also argue that the metric structures of the spaces differ inasmuch as two types of “apparent distortions” – marginal distortion in wide-angle photography and close-up distortions- which occur in photography do not occur in the corresponding visual experiences. In particular, I argue that the absence of marginal distortions in vision is evidence for a holistic metric of visual space that is spherical, and that the absence of close-up distortions shows that the local metric structure possesses a variable curvature which is dependent upon the distance away of objects being viewed. In this paper I will compare and contrast the geometric structure of visual space, which I am using to refer to the space of phenomenal visual experience, and the spatial structure of photographic images. I will argue that topologically both are two-dimensional and that both involve central projections of scenes being depicted. However, I will also argue that the metric structures of the spaces differ inasmuch as two types of “apparent distortions” occurring in photography do not occur in the corresponding visual experience. In particular, in this regard I will take note of both so-called “marginal distortions” in wide-angle photography, and alo so-called “close-up” or “perspective” distortions. I will argue that the absence of these “apparent distortions” in visual space shows that the space possesses a non-Euclidean (in the sense that not all of Euclid’s postulates apply to the space) metric structure. 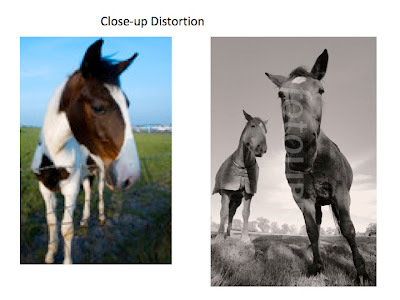 Before proceeding further it may be helpful to make a few comments on the way in which I will be using the term “apparent distortion.” In the photographic literature1 a distinction is often made between so-called “real” and so-called “apparent” distortions. 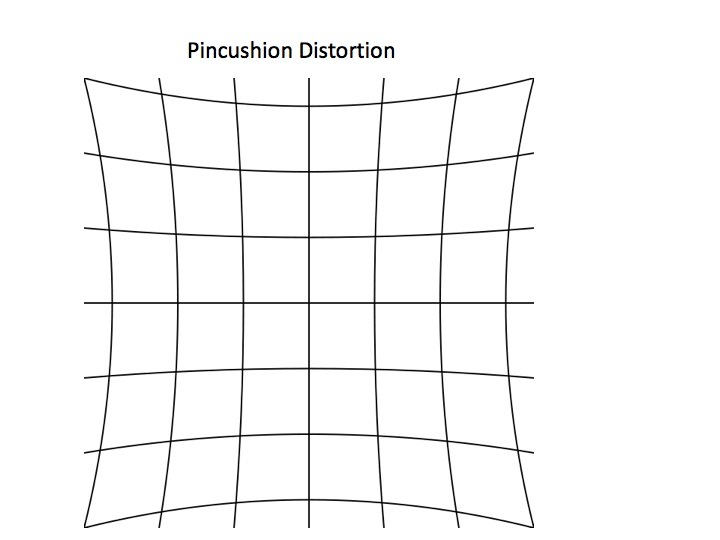 “Real distortions” are defined as deviations from a rectilinear perspective due to defective lenses, as for example occur with the “curvilinear “ distortions of wide-angle photography whereby straight lines are projected as being curved near the margins of the resulting photographs; diverging apart in pincushion distortion and converging together in barrel distortion. In contrast, “apparent distortions,” are defined as deviations between the geometric character of visual experiences and the geometric character of corresponding photographs even when no defects in photographic lenses are involved; i. e., where straight lines are projected as being straight in the photographs. I will now turn to some comments comparing the topology of visual space and photographic images; in particular on the issue of the dimensionality of the spaces. While, due to the existence of visual depth perception, it is often held that visual experience, unlike photographic images, are three-dimensional. I believe that this is clearly not the cast. The standard recursive defintion2 of dimensionality is not directly applicable to either case, being an “in the small” criterion in terms of the dimensionality of bounding spaces for all infinitely-small neighborhoods of points of the space in question; the dimensionality of the original space being one greater than that of the bounding spaces. Inasmuch as these neighborhoods will be too small to be visually distinguishable (the limit of phenomenal visual spatial acuity being approximately one minute of arc), it is not possible to strictly apply the criterion to visual space. However, it is possible to apply an analogous “in the large” criterion which was given earlier by Poincaré3 whereby the dimensionality of a space will be one greater than that of the dimensionality of the bounding space for any given region. Since regions of both photographs and also visual experiences can be bounded by a one-dimensional space (a line constituted by the boundary between a projected object and its background)l, it follows that the spaces themselves must be two dimensional. While counterexamples can be given to Poincaré’s analysis, such as in the cases of a point giving boundaries to two cones at their intersection, or a circle giving boundaries to a solid sphere embedded in a solid torus, it would seem that neither vision nor photography have much in common with these types of cases. In fact it can be noted that in the one case where prima facie it might be thought that visual experience is three-dimensional, when features of objects depicted possess different physical depths from the eye, this very fact can be used to constitute an edge, which constitutes a bounding line around the features in question. Further considerations pointing to the two-dimensionality of both visual space and photographic images include the points that, except in cases of semi-transparency, we neither see the interiors of objects nor intervening points between our eyes and objects being seen, and that these do not appear in photographs either. A second feature held in common between visual space and photographic images involves the fact that they both correspond to the results of forming a central projection of what is depicted onto a two-dimensional surface. Of course in the visual space case I do not mean that an optical image is literally formed by means of focusing light rays on the space, but rather that the geometric structure of images depicted in the spaced is isomorphic with that which would be formed by such a projection. Thus, in both the case of photography and that of visual space the image is such as would be formed by having a pencil of straight lines (e. g., light rays) pass from each exterior point on the front surfaces of the objects being depicted through a fixed point (the center of projection), and then cutting this pencil of straight lines by a two-dimensional surface at some location either before or after the fixed point. If the cut occurs before the fixed point the projection is known as a direct linear projection, and if it occurs afterwards it is known as an indirect linear projection. It can be noted that in indirect linear projections (which occur on the negative in photography and also on the retina of the eye), the image is in reverse. Rather than develop in more detail the just-mentioned issue of the nature of invariants of projection in the geometric structure of what is depicted, I wish to instead address issues concerning the shape of the two-dimensional surface which in vision cuts the pencil of rays of a projection. Is it a flat plane like the film of most cameras? Is it a cylinder like the film of a panoramic camera or the screens where wide-angle movies are shown? Or is it a sphere like a planetarium or the retina of the eye? Or is it a still more complex surface? By taking note of two “distortions” which occur in photography but not in vision (and where thus the geometric structure is not invariant between the two), I believe that it can be demonstrated that it is a more complex surface than any of these. I will first take note of a distortion, “marginal distortion,” which takes place in peripheral regions of wide-angle photographs in order to show that holistically the metric structure of visual space is spherical, and will then take note of a second type of distortion, sometimes referred to as “close-up” or “perspective” distortion, in order to show that when objects depicted possess different physical depths from the eye, visual space possesses a variable curvature. It can be noted that in central projections onto planes, as in most photographs, straight lines are projected as straight lines. However, areas in peripheral regions of a wide-angle photograph are not, as in the corresponding visual experiences, proportional to the visual angles subtended, but instead contain “marginal distortions” whereby areas in peripheral regions of the photograph subtend significantly smaller visual angles than do equal areas near the centers of the photographs. Since the field of view of vision is approximately 180o by 120o, which is greater than the field of view of even ultra-wide-angle lenses, I take it that the fact that marginal distortions do not occur in vision is evidence that the metric structure of visual space is fundamentally different from that of a flat photograph. 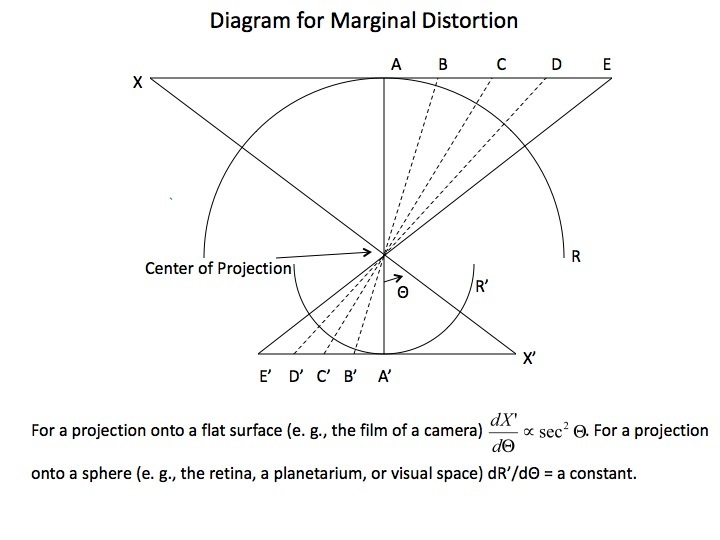 Before proceeding to make some positive remarks on what the metric structure of visual space is, I will enter into a short digression into the geometry of marginal distortion. It is true that in extreme wide-angle photography many of the foregoing effects can be avoided with a fish-eye lens, (where the effects are analogous to those present in a conic projection of a globe whereby a projection onto a cone is flattened out so as to form a circular image) but then, due to very-pronounced barrel distortion, straight lines are no longer projected as straight lines. In fact it is noteworthy that in vision also, unlike photography utilizing a rectilinear perspective, straight lines are projected as great circles which converge at both poles. For example, if a long rail fence is looked at head-on then the top and bottom rails will appear to converge towards each other in both directions although this effect will not be present in a wide-angle photograph; it being compensated by the marginal distortion which it was just noted also occurs in these photographs. 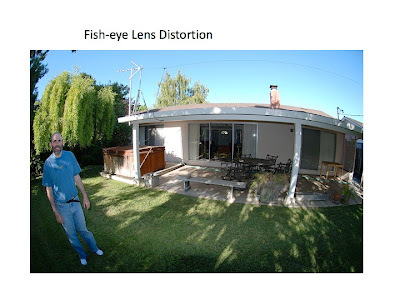 While it is true that such a convergence also occurs with photographs taken with a fish-eye lens due to the just-noted barrel distortion in the resulting photographs, unlike vision, these photographs will also possess a latitudinal “stretching” in peripheral regions in the sense that the projections of objects along azimuthal (circumferential) axes will be disproportionately large compared with the projections along the polar axes. It can be noted now that in cases of projections onto spherical surfaces equal solid angles of the projection will subtend equal areas of the sphere. 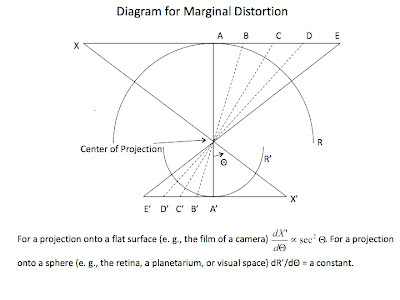 Hence it will both be the case that no marginal distortions will occur in these projections and also that there will be no disproportionate “stretchings” in projected images such as those occurring with the projection of a fish-eye lens onto a flat surface. I take it then that the fact that neither of these “apparent distortions” is present in vision is strong evidence that at least the holistic metric structure of visual experience corresponds to the metric structure of the surface of a sphere. Where ρ is the physical distance from the “cyclopean eye” (an imaginary eye centered between the two eyes) to the physical object being seen in the direction Θ, Ф at time t. While in normal circumstance a unique object will be determined by these conditions and thus the depth function will be a genuine function there are special cases involving semi-transparency where this is not the case. I will not attempt to deal with these special cases here though. The question thus arises as to how to use the just-defined depth function so as to define a transformation on the metric structure of a sphere, which will account for the size constancy tendency. Inasmuch as the tendency towards size constancy seems to be independent of the direction being looked at Θ, Ф, although as was noted being dependent on the physical depth, p, of the object being looked at, it follows that a visual space will be spherical when objects constituted in it are equidistant from the cyclopean eye, in particular when they are infinitely distant, a case approximated by looking at the sky. If two physical objects at different depths subtend equal solid angles with respect to the eye, the closer object will be constituted smaller in visual space than the more distant one, due to the tendency towards size constancy. Thus, inasmuch as the area on the surface of a sphere projected by a given solid angle is proportional to the square of the radius of the sphere, it follows that a visual space constituted from objects at greater physical depths will possess a greater radius than one constituted from objects at less depth. It also follows that a visual space constituted from objects infinitely distant will possess the greatest possible radius. I will close the paper by briefly mentioning some ways in which the preceding analysis may be able to explain other phenomenal aspects of visual perception. For one point, such an analysis predicts the existence of discontinuities in visual space when there are sharp physical discontinuities in the depth function for relatively close objects, and these discontinuities would seem to be capable of explaining the phenomenon of seeing an “edge” when one relatively close physical object partially occludes the view of another. Another phenomenal characteristic of vision which the analysis seems to be at least in principle capable of explaining is the tendency towards shape constancy; that is, the tendency for the visual shapes of objects seen askew to vary not in accordance with the laws of geometrical perspective, but instead to remain closer to the shapes projected when these objects are seen head-on. The main point ot be made here is that if an object is seen askew, then one edge of it must be closer to the viewer than the other, and thus both ρ and ρ’ will possess different values for these two edges, and the object will be constituted in visual space at a slant also. However, due to the inverse nature of Equation 4 relating ρ’ to ρ, the area of the object as constituted on this slant will not be sufficiently great so as for the object to retain the same shape as when seen head-on, and so it will instead be perceived at a compromise shape in between that shape and the one given by the laws of perspective. I also believe that in principle my analysis can account for the aspect of phenomenal depth perception which is enhanced by binocular vision. My claim here is that one can apprehend to some extent the internal metric structure of visual space, as for example by noticing the presence of a “corner,” of convexity or concavity, or the present of a discontinuity, in the space. Certainly visual space does not appear to be “flat” when the objects constituted in it possess different physical depths, and I wish to claim that one can use this “lack of flatness,” that is, the apprehension of an internal curvature , as a phenomenal cue for dept. It seems clear that these sorts of phenomenal depth cues are present to some extent even in monocular vision, since one can reverse a “Necker cube,” or see movies in depth using only one eye. As I previously noted, there is also a great deal of evidence that both the tendency towards size constancy and the tendency towards shape constancy are greatly enhanced in binocular vision. Thus, it would seem that the binocular depth cue of retinal disparity enhances monocular phenomenal depth effects by means of increasing the value of the proportionality constant a in the equation relating ρ’ to ρ, and I wish to equate the apprehension of the resulting changes in the internal metric structure of the space with the phenomenal apprehension of visual depth. This may also account for the striking so-called “3D” effects of random stereograms and so-called “3D” movies, although of course I am maintaining that the experiences, even here, are literally still two-dimensional; they just are not flat. 2. See Karl Menger, “What is Dimension?” in American Mathematical Monthly 50 (1943), pp. 2-7. 3. Henri Poincaré, Dernieres Pensees, translated b John Bolduc (New York: Dover Publications, 1963). 6. Nelson Goodman, Languages of Art (Indianapolis: Hackett Publishing Co., 1976), p. 15. 7. Robert Thouless, “Phenomenal Regression to the Real Object, I,” in British Journal of Psychology 21 (1931), pp. 339-359. 8. A. S. Gilinsky, “The Effect of Attitude upon the Perception of Size,” in American Journal of Psychology 68 (1955), pp. 173-192. 9. On the tendency towards size constancy being enhanced in binocular vision, see Edwin Boring and D. W. Taylor, “Apparent Visual Size as a Function of Distance for Monocular Observers,” in American Journal of Psychology 55 (1942), pp. 102-105; and E. L. Chalmers, Jr., “Monocular Cues in the Perception of Size and Distance,” in American Journal of Psychology 65 (1952), pp. 415-423. On the tendency towards shape constancy being enhanced in binocular vision, see Thouless, “Phenomenal Regression to the Real Object, I I,” in British Journal of Psychology 22 (1931), pp. 1-30. 10. For a description of the resulting internal geometry of visual space see Robert French, “The Geometry of Visual Space,” in Nous 21 (1987), pp. 115-133. I found Bob's paper very interesting as it addresses questions that are central to our blog discussion topic, namely, the structural nature of visual space. I take it from your abstract, Bob, that you are postulating two spaces: (1) what we have been calling visual space (VS) and (2) another space in addition to it, a photographic space. The first thing I would question is whether they are truly separate (or separable) spaces, or whether the geometry of photographic images might more properly be construed much as the geometry of any object or design in the visual world is, since a photograph is something inside visual space, not outside it, and also because photographic geometry is presumably also affected by the shape of the space in which it is embedded: VS. By definition (or convention) a Euclidean space is "flat" and a non-Euclidean one is "curved," though a non-Euclidean space can be locally flat. So I would first ask why two spaces are being postulated, rather than just talking about the geometric shapes/patterns of objects (in this case projections) within VS? Also, what is the topological relationship between the two spaces (presumably one is inside the other)? By photographic space I am just referring to a projection onto a flat surface, e. g., the film of a camera or a flat screen. Everything going on here is obviously physical, and thus everything is part of physical space. So long as the projection is onto a flat surface, the result is Euclidean, straight lines being projected as straight, although obviously things are also projected to be in perspective, but the sum of a projected triangle is still 180 degrees etc. Since both the resulting marginal distortions and closeup distortions are not present in phenomenal visual space, I take it that visual space is non-Euclidean with a variable curvature. As far as the relationship between the spaces go, I tend to think of 2D visual space as being embedded in a 3D space and curved with respect to it, but I am not at all dogmatic on this point. I think that it is a very interesting question, which we still do not completely understand, what the neural correlates of the space are and how these correspond to points in visual space. Mindful of both Bob's and John's admonition that we need to be tolerant of the use of different terms, one of the problems with any term is the potential for conflating senses of it, resulting in linguistic fallacies that may lead us astray. Bob's description of "photographic space" vs. "phenomenal visual space" to my way of thinking are both referring to the contents of the latter (VS), rather than referring (except by inference) to "physical space." The difference is one of point of view: The "third person" (realist) view is able to quite literaly *see* things such as the relationship between perspective projections (the perspective "plane") and the apparent volume of which they are (ostensibly) projections of (even in DaVinci's drawings, shown in perspective this relationship is depicted), the optics involved in the projection, etc. But these are still all things *seen* in VS, not somehow directly (or even indirectly) accessed in physical space. This was my reason for making the analogy to observation in relativity, which though it takes into account different points of view, does not consider whether those points of view are naive or critically realistic ones. Also, I believe that even a locally non-Euclidean space with variable curvature cannot be embedded in a globally Euclidean one. There are no neural correlates of points in visual space in the visual cortex, only cells that respond differentially to small regions of the (phenomenal) visual field in so-called visual area 1 (V1), i.e., so-called "spot detectors" as they were initially called, with the next cortical layer up (V2) responding only to moving targets, which were initially dubbed "edge detectors" (John: please correct me if I have misstated this or oversimplified things). Again these are "spots" and "moving targets" (or "edges") that are also seen by the neurophysiologist in the "phenomenal" visual field as well, because visual neurophysiology does not measure properties of physical objects per se (e.g., reflectance), only those the neurophysiologist sees as well, as shown on a screen (most frequently to an experimental animal volunteered for that purpose). This is what I mean by "third person naive realism," because all these things are going on in the visual world, and only by inference in the physical world. If these same events were interpreted in terms of Eddington's second writing table, they wouldn't look like anything, because appearance is a property of the visual world, not the physical one. Thorne Shipley, one of the vision scientists who performed so-called "alley experiments," had a painting by the Venetian painter Canaletto on the wall of his office. It depicted one of the canals and, as I recall, the sides of the canal were not straight, but slightly bowed, by which Shipley believed Canaletto intended to capture the impression of how parallel lines look in perspective. I'll try to find a print of the painting to post here. There seem to be three levels of "depths" in the visual field. "Everything seen was flat, nothing had thickness or depth in it; stereoscopic vision was completely abolished...A box seemed to him a piece of flat cardboard, no matter at what angle he saw it,... And a glass tumbler looked like a piece of flat glass which changed in shape as it was moved about. When placed in front of a line of steps he saw only a number of straight lines on the floor." Presumably these different levels of depths perception (1 and 2 versus 3) correspond to anatomically different levels of neurocomputation. Can we conclude that the basic visual flat is completely 2D? This corresponds to the way the stroboscopic patterns (the geometrical we observe on looking at a flashing light) are presented. These too are completely flat and cover the entire completely flat visual field. I think the word "levels" should perhaps be avoided, lest it be taken too literally, or prove to be a source of ambiguity when we need to be as literal as possible. Vision scientists categorize perspective as being a monocular depth cue, because it exists independently of binocular vision. The perspective projection we see in the visual world, with all its converging lines and horizons, could be said to contain 3-D "information," because by definition, a perspective projection is two dimensional. However, when that perspective view is “enhanced” as it is with binocular vision (so-called “binocular cues”) planes within it appear to be detached from one another, rather like a relief. The case Gordon Holmes reports suggests that what was lost was his patient’s ability to *interpret* perspective cues, i.e., to interpret monocular depth cues as a result, much as was reported by the newly sighted blind in von Senden’s work. This would argue for the idea that perspective is *not* initially perceived as depth (as J. J. Gibson might like), and that some sort of correlation must take place between monocular depth cues and binocular depth cues that it is that correlation that lost by Holmes’ patient. I would not attribute this however to any form of “neurocomputation,” because I do not believe the brain is computing anything, simply because I do not believe it is a computer (cf. Raymond Tallis’ “Why the Mind is Not a Computer: A Pocket Lexicon of Neuromythology”), even though that myth has been strongly promoted by an unholy alliance between cognitive science and the computer industry (before it was a computer, the brain was variously a telegraph system, then a telephone exchange, a movie theater, and a TV system—the analogies have changed with technology). To make a few points in response to the helpful comments from Bill and John. First with respect to the comments of Bill, I want to make it be clear that I am referring to actual physical photographs and not our visual perceptions of them. The photographs can tehn be tested for a Euclidean metric by such methods as using a straight edge to test for deviations from straightness, or a protactor for measuring angles. The points concerning neurons in the visual cortex being sensitive for edges and so on are well taken, but my understanding is that there are also neurons sensitive to specific retinal disparities and I think it is a good question whether these have something to do with the production of phenomenal depth cues in the metric structure of visual space. Certainly a 2D spherical surface can be embedded in a 3D overall space, and I don't see why a "wrinkled sphere" (perhaps there is better terminology here which I am unaware of) which possesses a variable internal curvature cannot be similarly embedded. With respect to John's points, I agree that there is depth perception with monocular vision, which is enhanced in binocular vision. However, I deny that either case involves a genuine third dimension (we are, at least typically, not aware of the interiors of objects being seen in either case). Instead, I try to account for the phenomenal depth effects in terms of the awareness of the internal variable curvature of the space. It would certainly make life easier for us if things were simpler than they are, but as it turns out, there is a sort of continuum of cellular responsivity in V1. Just grabbing this from the web, it summarizes the situation just as well as I can: “Hubel and Wiesel (1962) first demonstrated the presence of cells in primate V1 that responded preferentially to visual stimulation in both eyes as opposed to one eye alone. They classified cells using a 7-point scale where 1 = cells excited by the contralateral eye alone, 2 = cells with a strong bias for contralateral stimulation, 3 = cells with a weak bias for contralateral stimulation, 4 = cells that responded maximally to stimulation in both eyes, 5 = cells with a weak bias for ipsilateral stimulation, 6 = cells with a strong bias for ipsilateral stimulation and 7 = cells excited by the ipsilateral eye alone. The proportion of monocular cells (1, 2, 6, and 7) versus binocular cells (3, 4, and 5) was found to vary with the layer in which cells were recorded.” But the main point is that the center-surround pattern (“spot detector”) and “edge detector” characteristics are the same, whether the cell responds primarily to monocular or binocular stimulation. How to reconcile that with monocular vision and binocular vision as being more or less categorically distinct is another problem. My inclination is to believe that the visual system is not "making" visual space at all, but if anything, as I have suggested, is in some sense "digesting" it for the purposes of coordinating the body with the environment. It is as if part of the machinery for *creating* visual space is missing from current models, or at least unaccounted for in them. In other words there does not seem to be a process in the visual system as we currently know it that looks anything like what would be involved in building up a visual world, only tearing it down, much as many other metabolic processes do in our bodies. I don't seem able to find it right now, but there was a paper by Hubel & Wiesel published in "Scientific American," a special issue devoted to the brain, c. 1980. In it they explicitly say what I have said above, that they see no evidence of the brain constructing (or reconstructing) the visual world, but only an analysis of it. They go so far as to say that were there a homunculus in the brain to look at such a "picture" he would be very confused by what he sees instead! Further to Bob's points, clearly there is no problem with a curved surface being embedded in a Euclidean 3-space. But what has been claimed is that visual space is a *three dimensional* non-Euclidean space, not a two dimensional one. I am not sure how Bob is defining a "physical photograph," because clearly he has something in mind other than an Eddingtonian physical object (if I may use that shorthand to allude to the famous "second" writing table). It does seem to me that he is comparing the *perception* of photographs, whether just looking at them or measuring them as he describes, with the perception (and measurement) of other objects in the visual world. Perhaps I have missed something? I am not sure whether this is going to help or not Bill, but I hold both that visual space is two dimensional and that it is non-Euclidean, having a dynamic variable curvature. It is the physical photograph, and not our perception of it, whose geometry I am comparing with that of visual space. Your points about Hubel and Wiesel's work about binocular cells is again well taken; but I still believe that the brain in some way constructs the visual experiences, but I admit it is not obvious how this is done. I think that it is a very interesting problem well worth tackling though, although I am not sure that we are capable of solving it yet. It may come back to terminology, Bob. Usually the term "space" in this context refers to spatial extension in greater than two dimensions. If you are arguing that visual space is a curved slice of a Euclidean three space, there is certainly no problem. But if you are saying that the curvature is three dimensional, rather than that of a surface, then you are talking about what is customarily called a "non-Euclidean space" (meaning that the space, again, being extension greater than three dimensions, is curved in three dimensions, not just two). It might be helpful if you explain what you mean by a "physical photograph," because in a larger context, all a photograph does is simulate on a plane part of the stimulus pattern characteristic of the perspective projection effected by the optics of the eyes, part of what vision scientists call the "distal stimulus" (in contract to the "proximal stimulus," i.e., retinal stimulation). So when you say "physical photograph" are you talking about the inferred molecular structure or a computer-generated equivalent with differential surface reflectivity or patterned illumination that physics would define as the physical counterpart of a picture? I guess I don't know what you mean by "physical" here. Reflecting on my experience, I find myself agreeing with the eminent Cambridge philosopher, Dr. C. D.Broad, "that we should do well to consider much more seriously than we have hitherto been inclined to do the type of theory which Bergson put forward in connection with memory and sense perception. The suggestion is that the function of the brain and nervous system and sense organs is in the main eliminative and not productive. Each person is at each moment capable of remembering all that has ever happened to him and of perceiving everything that is happening everywhere in the universe. The function of the brain and nervous system is to protect us from being overwhelmed and confused by this mass of largely useless and irrelevant knowledge, by shutting out most of what we should otherwise perceive or remember at any moment, and leaving only that very small and special selection which is likely to be practically useful." Huxley liked to call this function the "cerebral reducing valve." Perhaps the most compelling evidence of that from neuropathology is that most CNS dysfunction is of the nature of disinhibition. I think that part of our dispute is indeed terminological; I have been using "space" to include 2D spaces, if "surface" is less confusing that is fine. One can still talk about a deviation from the Euclidean geometry of a flat 2D surface, and I am arguing that visual space does deviate from this. By a physical photograph (I wrote this paper before the age of digital photography) I am referring to the molecular strucutre (inferred or not) of a photographic print, where the geometry of images on it can be determined by using a straightedge and a protractor. I also like Broad, but I should emphasize that I do not hold any version of the identity theory including dual aspect versions of it. Thus, I do hold that neural events in some way causally determine phenomenal events in visual space, and I really do not know how this is done. Okay. That is a help, but I would still counter that the *act* of measuring such a photograph is still something for which we require vision, much as we do in performing alley experiments and measuring the deviations in the alleys. The difference, as I see it, is that rather than seeing an environment, one is looking at a representation of an environment. In principle one could have been present when the photograph was taken and seen with one's "naked eyes" the things "captured" in the photograph. So I still see this as a disparity between things seen, thus within the visual world, not one between something physical and something visual as you suggest, Bob. I will make a few points to try to help clarify things Bill. First, I don't see how physical properties of a photograph differ in character from those of other physical objects, so, unless you are an operationalist about physical properties in general Bill, I don't see why visual experiences are any more involved in the photographic case. A second point is that of course we can also talk about the case of visually viewing a photograph, in which case with wide angle photography objects near the edges appear to be disproportionately large with respect to the corresponding visual experiences of the objects being depicted if the same angle of view is being used throughout, and analogous points can be made for close-up objects. I take the absence of these apparent distortions in our visual experiences as evidence for a non-Euclidean metric structure for visual space. Perhaps this case of visually viewing a photograph is what you are referring to Bill, but I prefer to make the comparison between the visual experiences and the actual physical properties of the photograph, since there are further complications here about viewing conditions of the photograph etc. If VS exhibits a non-Euclidean metric (= one of curvature) why does it not also alter the contours in photographs accordingly as it does our perception of any other object? It does, but the marginal effects only occur if the view of the photograph comes close to taking up the whole visual field, and closeup distortion, at least typically, involves depictions of objects whose parts are at different distances from the eye when the objects are also close to the eye. Part of this disparity in geometries (pictorial/photographic vs. that of the ordinary visual world) might be accounted for by the fact that a photograph is already a projection (a central projection on a plane), whereas with VS overall, the geometry is (presumably) a function of projection directly on our (curved) retinas, without any intermediate plane projection. So with a photo we are getting a projection of a projection! I take it that you are referring to the case of viewing a photograph when you refer to a projection of a projection Bill. It is also noteworthy that even in photography when extreme wide angle effects occur, projections often are made onto curved surfaces; e. g., curved screens in some cinemas, or the case of the dome of a planetarium. Yes, the old Cinerama screens were very wide and also curved, and it is interesting to view those films on a flat TV screen, as one can with the DVDs of them. The screens in IMax cinemas are, of course, also curved. Bob, I am not quite sure that I understand why you are positing that VS is non-Euclidean on the basis of the evidence you provide in your paper, and why the distortions cannot be accounted for on the basis of projective geometry? Presumably the geodesics on a spherical (or quasi-spherical) surface would be great circles. The phenomenological question is whether the geodesics in a non-Euclidean space would be perceived as straight or curved. In the case of a projection onto a sphere, or part of a sphere, if straight lines are identified with geodesics, then the sums of the angles of triangles are greater than 180 degrees and the sum of the angles of squares greater than 360 degrees, and also the geodesics converge at opposite ends (the poles). This coincides with a non-Euclidean geometry of positive curvature, such as that described by Gauss, Riemann, and Bolyai. The situation obviously is more complicated when I also try to account for close-up distortion with a variable curvature. You do raise an interesting question concerning whether geodesics are always perceived as being straight; they are defined as the straightest lines (an alternative definition, which is usually equivalent, is that they are also the shortest distances between two points). Thus, whether the fact that they are perceived to converge towards each other in both directions should count against their percived straightness is a good question. There is nothing about VS that suggests it is a complete spherical surface, or even part of one, so the notion that it possesses curvature is derived rather than apparent. By comparison, the surface of a sphere is unbounded, whereas VS clearly is bounded at its periphery. I think the larger question is whether these geometries, and the methods used to determine them, really reflect the geometry of VS as such, or just objects in it? How can one in principle tell the difference? To make a partial reply, at a given time, as I see it, conscious visual space just consists of part of a sphere, corresponding to the roughly 180 degree horizontal and 120 degree vertical range of the stimulus field. This clearly is bounded, but an added point is that when we slowly move our head (and assuming the non-existence of vertigo), objects constituted in the space do not appear to move, but rather we lose awareness of objects on one side and gain awareness of objects on the other side. Subjectively this suggests that the part of the sphere where conscious experience occurs has shifted; but it is a good question how literally to take this. I am not sure you can make a distinction between visual space and objects in it; since if we are just talking about visual experiences here, these visual experiences are spatially extended in the space, and it is not clear to me that they in any sense possess a separate existence. I don't know how much this helps, but it is the best I can do for now. It strikes me that the claim VS is "part of a sphere" may be underdetermined both visually and by experimental data, given how little resolution of angles, lines, and contours there is in the periphery (and probably much beyond foveal VS). We certainly don't have a general impression visually of occupying a curved space except, perhaps, for the impression of the night sky, which I mentioned above, but we attribute that shape only to the heavens, not to the terrestrial world we see. On the other hand we know what things look like on a curved sphere such as a globe of the world. But we do not experience the world around as as looking like that. In other words we do not see a curved world. How is this to be explained on the premise that it "really is" curved? You certainly make a good point Bill that there is much greater visual resolution in central regions of visual space, corresponing to stimulation from the fovea, than in peripheral regions. Since introspective evidence for a holistical spherical metric (such as with Angell's example of each of the corner angles when looking at the ceiling appearing to be obtuse)tend to involve peripheral regions, it does make the criteria harder to apply. Nevertheless, we are not aware of marginal distortions in peripheral regions, even with low spatial acuity, and these should be enormous, given the extremely wide frame of view of human vision compared with most photographs, if the projection was onto a flat planar surface. As far as your point about our experience of the world not appearing to be curved, remember that we are talking about the internal geometry of a sphere here (where the coordinate system is actually embedded in the space itself) and not an external geometry (involving embedding the description in a higher-dimensional space). Thus, the fact that our visual experiences are not like the Mercator projection, where projections in polar regions are made disproportionately enlarged, I take as evidence for an internal spherical geometry. Also, as you have pointed out earlier, there is some introspective evidence for experiences of physical parallel lines tending to converge at both ends in peripheral regions, albeit with very little spatial acuity in those regions. I think it is important to distinguish foveal vision under fixation from that of foveal vision with moving eyes, because they may suggest different geometries. I am not convinced that we can resolve angles outside the foveal region, and clearly there is no angular (barrel) distortion of ordinary shapes when fixated in foveal vision. The orientation of straight lines shifts perceptibly as we track them with our eyes, but we cannot really do the same in viewing angles, because once an angle is outside the foveal area, we really can't make it out to determine if it has increased/decreased (it is rather like chasing one's tail). I wonder if what Angell reports of looking at the ceiling is with/without fixation? I just don't see (no pun intended) how one can empirically claim VS is spherical (1) because the geometry of (visual) objects changes with changes of eye position and thus (2) the sphericity cannot be perceived when the eyes are fixed in one position. This is why both introspective reports and experimental measures need to be carefully re-checked in light of eye position (IMO). I predict that eye position has not been controlled for in either. The claim that visual space is spherical is old, dating at least back to Thomas Reid's discussion of the geometry of visibles in his Inquiry into the Human Mind (1764), but as far as I know none of the literature on the subject includes controls on eye movements. One cannot help but wonder to what extent the idea that VS is spherical derives from knowledge that the eyes are spherical? It probably should not be assumed that because the eyes are spherical that VS must also be. What then is the strongest evidence that VS is spherical? Further to my previous comments about the shifting of lines in VS, if one gazes up at the ceiling and "runs" one's eyes back and forth along the full length of the line formed where the wall meets the ceiling, you can clearly see how the slope of that line changes as one moves one's eyes along it. My contention is that such changes in line orientation in VS are like tangents describing the shape of a curve, but not a seen curve. I suspect all that the alley experiments are doing is measuring the movement of lines (or line segments) along an arc, rather than visual straightness. When we sight down a shaft to see if it is straight, such a shaft does not look curved, otherwise such sighting down of shafts would not yield straight shafts as it does. I agree with you Bill that nothing necessarily follows from the eyes being spherical; and there are other complications concerning other arguments, which show perhaps that not everyone is using the same concept of visual space in the literature. For instance, some of Angell's examples include the horizon line coming back on itself and the view of railroad tracks converging to a point in both directions; and these clearly only occur if head movements are allowed and thus involve successive visual experiences in time. Angell's sense of "visual space" thus does not seem to be confined to phenomena which can be experienced at the same instant. This may also be true of the corners of the ceiling example if it involves looking at each corner individually in a series of views. There are complications with Reid as well, since he in his later work, such as his Essays on the Intellectual Powers of Man takes himself to be defending common sense and holding that the objects of perception are physical objects. Whether he was also assuming some version of direct realism in his Inquiry when he speaks of the "geometry of visibles" seems to be a question of interpretation. In any event, both Reid and Angell do give the argument that the sums of angles of objects constituted in visual space are greater than if they were constituted in a Euclidean space, and Angell gives the example of viewing a picture frame here. A variant here would be looking straight up at a ceiling composed of square ceiling tiles, and seeing whether each angle is obtuse. No head movement is required here. In my NOUS paper I give a reproduction of a distorted checkerboard from Helmholtz, where if the figure is viewed closeup so as to occupy almost all of the visual field it appears as a normal checkerboard. In this example, as with the example of marginal distortion in photography, one must include effects in peripheral regions of visual space to get the effect. Thus, I take it that the strongest evidence that conscious visual space at any given instant possesses a spherical metric involves effects from peripheral regions.I don't see any good reasons not to allow these, but perhaps you do. This precis is very helpful, Bob. It seems to me that there are actually two questions of definition involved: (1) what is being defined as visual space (or that which is more or less the same but called by other names) and (2) what it is being geometrized. For the moment it probably does not matter whether the writers you mention above partly or wholly subscribed intentionally or unwittingly to naive/direct realism, because it is clear that everyone lapses into the latter, whether in philosophy or the physical sciences. We are defining/geometrizing "what is seen" in any case, and I think it is reasonable to assume that these earlier thinkers were doing the same (barring unequivocal evidence to the contrary). In any case, if we are hoping to do good science (if not philosophy), we need not only replicability of observations and results, but to be able to check every link in the chain of inferences of any theory concerning what is observed/can be observed. I am surprised by Angell's incredibly naive conclusion that seems to make no reference to perspective, in which lines converge: We live in a perspective world, one might say, and would think Angell would have known that. Probably a more faithful description than a "series of views" would be that of a continuous transformation that occurs as a function of both eye movements, head movements, and bodily movements. This is probably the chief strength of J. J. Gibson's "ecological optics" because it stresses the transformational aspect of visual perception, rather than being conceptualized as a static succession of "images" as in earlier formulations. For that reason, I would propose that any "curve" that is seen in the conditions you describe above is a result of such transformations occuring over time as a function of eye and head movement. I say that because beyond a certain visual angle it is just not possible to resolve angles, and for the curves (or "distortions") to be seen must therefore depend upon changing eye position. The reason they are visible in wide angle photos such as the ones you included with your paper is because we are viewing the shapes within a small visual angle, projected on a plane in VS. We could not even see the contours of a real horse's head as depicted in the photo at such a close range without moving our eyes and probably our head. For that reason alone we likely never see such distortions in the visual world--except in photos. You make some good points Bill. My own background is in philosophy, but it probably would be a good idea if someone was to do some controlled (including for eye movements)repeated experiments here with respect to some of these cases which have been cited as evidence for a spherical overall geometry. I would be happy to provide any material that I know of if that would help. A dearly departed psychologist colleague of ours, Richard Gregory, liked to call his field of research "experimental philosophy," after the laboratory so named at Cambridge, and the fact that a few philosophers have continued to be interested in the geometry of VS is intriguing, as one would have expected that its investigation would have long since come under the purview of vision science. The problem has been that no one who has been involved in the visual alley-type experiments, or their interpretation, has (apparently) realized that the interpretation suggestive that VS is curved involves a violation of the principle of contradiction, because straight lines cannot also be curved. The way this interpretation gets out of that dilemma is by claiming that seen lines are geodesics in a curved space, and therefore because of that look straight, but when mapped to locally Euclidean physical space are curved (I believe that is the logic of the analysis). But it has never been made explicit in the geometry of non-Euclidean spaces whether geodesics would also *look* straight, nor how one determine that. Has anyone modeled VS as a topographic relief? That would seem to me to be the most analogous structure to it, and certainly such reliefs have been used to simulate 3-D. The main difference is that in VS there seem to be discontinuities in the depth planes, such that one sees in a Random Dot Stereogram a square separated from a uniform background, but with nothing between the two--except, perhaps, an inferred "empty" space. The square seems to sort of hover over the background, as if suspended in space. Obviously in a relief the surface is continuous with no such discontinuities. You make an interesting point Bill that geodesics in a curved (from a higher dimensional point of view)visual space may look straight, since there are none straighter. Modeling visual space in topographic relief, possibly with a computer-generated model, also sounds worthwhile, although under my model the relief would have to be dynamic in time, as a function of the distance away of objects being viewed. I think maybe the biggest priority now though is to get someone interested in conducting the controlled studies we were talking about with respect to how people see apparent distortions. I think the key word here is "apparent." Surely a shape seen is either distorted or it isn't (presumably distorted relative to some standard to which it is compared). It is not clear to me how something can be only "apparently" distorted. Can you explain, Bob? 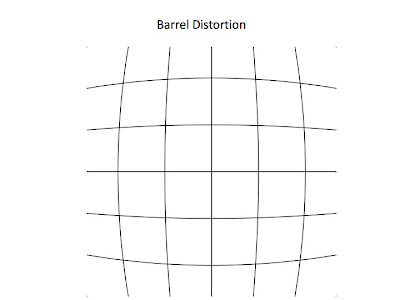 Perhaps the word "apparent" in "apparent distortions" is not ideal but it is used in the photographic literature to contrast distortions which are psychological from ones that involve deviations from straight lines in the actual physical photographs, as with barrel and pincushion distortions. Of course, even with the so-called "apparent distortions" of close-up and marginal distortions the psychological effects are real, in the sense that our visual experiences of the objects being depicted in the photographs from the same point of view really do differ from them, even in manners which can be quantitatively described. Clearly the photographer's distinction between "real" and "apparent" distortions reflects a form of naive realism, don't you think? The photographer seems to be saying that we directly see "physical photographs," whereas the surrounding visual space is something "psychological," thus making a division within the visual world, rather than between it and the physical world. The reality status (ontological status) of things in the visual world seems hierarchical, with some things being designated "physical" and others "psychological." You may be right here Bill, but it is a little hard to say. 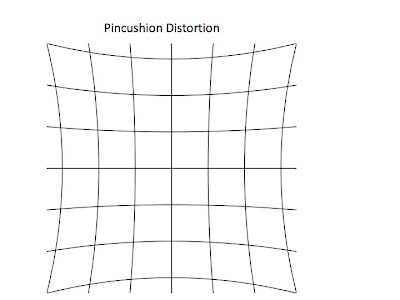 I think basically they were trying to make a distinction between distortions caused by defective lenses, which would cause a deviation from a rectilinear perspective, as with barrel and pincushion distinction; and cases where even though there was a rectilinear perspective onto a flat surface, psychologically the result does not appear right; i. e., does not appear the same way as when we visually look at the physical objects being depicted from the same point of view. From what I understand this boils down to two *visual* conditions: (1) where things "look distorted" (for whatever reason) and (2) they should (?) look distorted but don't because the geometry of VS is curved and the curvature in some way normalizes them. Is that the essence of the argument? The problem with (2) is that is involves selecting an interpretation, because things may appear/not appear distorted for more than one reason. For example, a "crazy" mirror in a carnival "fun house" will distort the proportions of one's reflection because the surface of the mirror is uneven. Such distorted reflections may include barrel/pin cushion distortion and closeup distortion. The difference is that with the mirror distortions one attributes them to the variable surface of the mirror rather than to a photographic lens projecting on a flat plane, and because of its curvature (that of the lens) the distortion occurs. The naive viewer of a photo with such distortions just attributes them to the photo, not to the photographic lens and projective geometry. So I'm not convinced that this is wholly an empirical question, but may involve some conceptual ambiguity/unclarity. "Just! What is just? You say it is dealing equitably or equally. Not by inequality of mind; not by a mind incapable of weighing, judging, or distributing. If the lengths seem unequal in the broken mirror, for you they are unequal; but if they seem equal, then the mirror is true." I think we must distinguish what is given in VS from what is the result of *visual judgments,* i.e., judgment about things in VS, because as John cogently noted, with associative agnosia, one sees a complete VS but cannot interpret it, or "process" it as cog. sci. people would say. This suggests that VS is not a priori "mental" in any ordinary sense, and that it possesses a certain autonomy, separate from cognition--i.e., that which is prerequisite to comparisons needed to make judgments of "just" length of lines, as Ruskin describes. 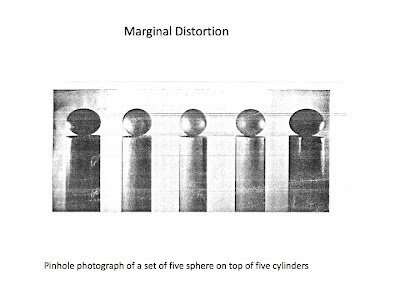 You are quite right Bill that images from a curved mirror also can appear distorted, and one really needs to get into the optics of how mirrors work to explain why. You are also right to make distinctions between judgments and appearances (Angell also makes a similar distinction), but it turns out that there are many different types of judgments that need to be distinguished here also; e. g. judgments about actual sizes and shapes, vs. judgments about apparent sizes and shapes etc. I think that some of the literature on visual space involves arguments past each other due to different instructions about what participants in experiments are supposed to be judging. It occurs to me that "apparent size" is only meaningful in VS if it relates to some other perceived size in VS that is considered to be "actual," yes? In other words apparent vs. actual requires some sort of comparison of things *within* VS. I remain of the opinion that a certain amount of confusion results from distinctions made within VS, some of which are deemed "real" or "actual" or "objective, or "physical," the rest being "psychological," or "apparent," or "subjective" (as in "subjective contours"), os "illusion," or "distortion," etc. We should be mindful of the optics involved, that an optical projection reflects the charactistics of the surface upon which it is made as much as the characteristics of the lens. Thus Ruskin's saying that a "mirror" is "true" when equal lines are seen as equal. But again, that is something *seen* first, then judged. Of course I should hasten to add that a reflection of any kind is categorically different from a picture (for one thing the image is reversed), but like any photo or projective drawing/painting, it also ironically "reflects" the reflecting surface! This prompts me to mention that light is reflected from the retina back out through the pupil, otherwise it would be impossible to photograph the retinal image. Some of that light therefore goes back to the surface of the object that reflected it so that, in a very real sense, our eyes are shining light on physical objects as we look at them. You are absolutely right Bill, there are so to speak a lot of snakes in the grass here. The words "subjective" and "objective" are notorious for their ambiguities; three distinct senses being of the subject vs. of the object; being reproducible under at least certain conditions; and being relative to something else; e. g., individuals, cultures, or viewing conditions. Thus something can be subjective in one sense (being of the subject) and objective in another sense, such as for answers to be reproducible. "Real" and "apparent" are just as bad since one can even talk about "real hallucinations" or "real dreams." Try looking up the meaning of "virtual image" in the optics literature, it certainly sounds real in many senses. 1. non-Euclidean geometry of this space. or parts of this space. in which tis screen is 'embedded'. 2. distortions of this screen itself. 3. distortions resulting from "soft-ware" processes in the construction mechanism. The theory further suggests that the apparent 3D structure of the VF (the "blue dome of the sky", etc.) is brought about by a process in the construction mechanism similar to that which produces 3D TV on the flat TV screen. For readons I already stated, I don't believe that the representative theory can be considered as being axiomatic, nor thus that VS can be "recognized" as being a "TV-like screen." When I look out at my surroundings I have no impression of looking at anything like a screen, nor of it being 2-D, because of sterescopic depth. In other words, VS does not appear to me to be a surface, in the ordinary sense of the term. As I have argued already it is not clear that VS is non-Euclidean and that the conclusion it is may be based on a misinterpretation of different experimental findings. 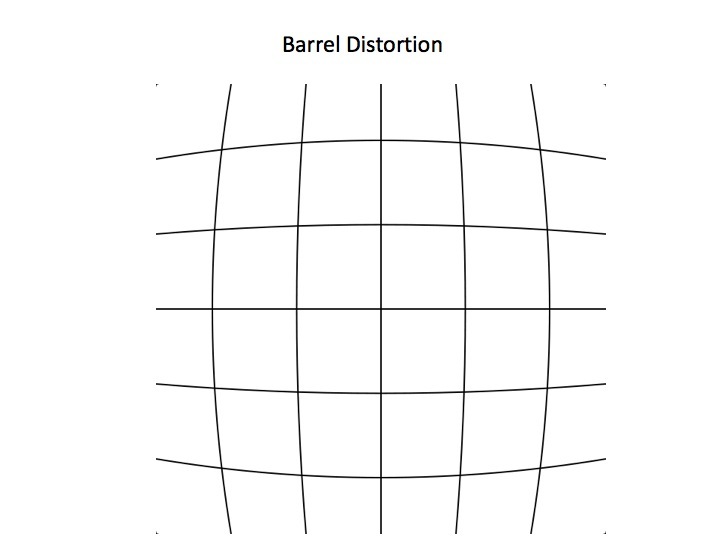 We are unaware of there being any global sense of "distortion" in VS, so I question if such distortions have been correctly interpreted. There are no "software" processes in the brain, nor anything that seems to be making a "picture" on a "screen." Either VS possesses third dimensional extension or it does not. That seems subject to different interpretations, but appealing to the production of stereoscopic images would only apply to combining the two retinal images, which are indeed on curved surfaces. If these are combined to create separate depth planes, is there evidence of that in the visual cortex? To reply to John's comments, I agree that there are several possible ways that a variable curvature could be caused; visual space might be curved with respect to a higher dimensional space in which it is embedded (e. g. the brain), but it could also be the case that some other process is responsible for stretchings and shrinkages. In reply to Bill, I don't find binocular depth perception to be that different from monocular depth perception (for example we can reverse a Necker cube with one eye), and I hold that stereoscopic depth just involves an enhancement of features of the variable curvature metric which are also present with monocular vision. We are not aware of the interiors of objects any more with binocular vision than with monocular vision, and I the test that I use for determining dimensionality; the dimensionality of a bounding space, remains a line constituted by the perception of an edge. Information from the two retinas is combined in the visual cortex, but the stereoscopic visual experience could be located elsewhere for all I know. I still don't think that we have found the answer (if an answer is to be found) for the immediate neural correlates of visual experiences. From all my comments it should be apparent that we must retrace our steps to make clear what we mean by "seeing depth," because I believe that is getting lost in the higher order analysis of surfaces (whether curved or not) and derivative ways of defining dimensionality. I am not sure that "enhancement" is quite an adequate term to describe the difference between monocular VS and binocular VS. For one thing "enhancement" is not a term from geometry but from image processing. In the past I, too, have made the argument that VS is not 3-D because we do not see the interiors of solids (unless they are transparent or translucent), not the backs of them. But it is not clear to me now that defining visual depth--and thus tri-dimensionality in general--requires being able to see those things. Once again, my antique Volvo's dash board lights and tail lights have gone out, even after replacing the fuses, which were blown. Obviously something else is going on, and it is the same with the visual system: All that experimental neuroscience can do for now is make ever closer correlations between brain events and visual ones, but my strong impression is that though VS is linked to the brain in some way--perhaps not causally, but spatially as John maintains--the brain is not making it, as Hubel and Wiesel blithley stated many years ago: no picture is being made by the brain, in spite of appearances that might suggest that. If that is so, VS must be structured and articulated by some other means, perhaps as Culbertson has argued, closer to the other end of the causal sequence. Unfortunately as I noted back in 1985, science does not provide us with a physical world that would readily make that possible, unless Q.M. and quantum entanglement is somehow involved. No one seems to be offering a quantum version of VS specifically, though quantum theories of consciousness in general have been advanced by theoretical physicists since the late 1970s, most notably by Evan Harris Walker. So that I don't just seem like a perpetual nay sayer, probably I should say at this point that I am a great believer in the value of intuition in scientific discovery, and for that reason, think it is quite possible that John and some of the other thinkers with unconventional theories mentioned thus far may all have intuited aspects or components of the solution to the mystery of conscious visual perception. But sometimes such intuitions require a good deal of working out to fit the facts, and do not necessarily occur to one in the final form of a theory. We should perhaps be comforted by the fact that Einstein never did finish the General Theory of Relativity, in spite of the intuitions he had about it. I checked with Ramachandran about binocular cells in V1 and he said that they are found in layer 2 and 3 (with monocular cells occurring in layer 4), and typically respond only to one depth plane in physical space, and that young animals are born with such binocular cells (referring to his own experimental brain studies with young ungulates back in the late 1970s and early 1980s). Though it is tempting to therefore identify these cells with the depth planes in binocular VS that we actually experience, I am equally tempted to think that in some way they are actually responding to the depth planes in VS, rather than the putative corresponding ones in physical space--this in accordance with my counterintuitive proposal that perhaps the cortex is decomposing VS, rather than generating it. Rama also mentioned the case of Susan Berry, who was studied by Oliver Sacks, and whom he nicknamed "Stereo Sue." She did not experience stereopsis until later in life. Last year her memoir about her experience was published, "Fixing My Gaze: A Scientist's Journey into Seeing in Three Dimensions." Note the title includes the phrase "three dimensions," and not learning to see a 2-D surface as 3-D.
You may be right Bill that "enhancement" is not the ideal word, and perhaps you have a better one for what I have in mind, but, as I give note of in the references to my paper, I am referring to such phenomena as increases in the tendencies towards both size and shape constances, which are pointed out by Thouless in his discussion of the "phenomenal regression to the real object." An added point, is that binocular depth cues are not the only relevant ones here, and as far as I can see any single depth cue can sometimes be overridden by other ones. With random dot stereograms binocular disparity overrides, but as Adelbert Ames Jr. has demonstrated with his rooms with distorted wallpaper for textural cues or an inflating balloon appearing to come towards us, others can override stereopsis. As an aside, I might point out that Rudolph Luneburg was working for Ames at the Dartmouth Eye Institute when his book "Mathematical Analysis of Binocular Vision" was published in 1947. One problem IMHO that hampers progress is that we have a hybrid technical vocabulary that reflects not a single unified conceptual framework, but different individual concepts. On the one hand we talk about VS in geometrical terms as possessing a shape or metric, perspective projection, but then on the other of one analyze of its dimensions in terms of image processing ("enhancement"), only to switch to talk of of monocular and binocular "cues," or illusions vs. veridicality, and size/shape constancies. How does one synthesize all of this into a geometrical/topological account of VS? Bill, “Nay-saying”, especially as found in this blog, is an enormously important part of the process of discovery. There is far too little of it in science. Most papers contain hardly any self-criticism, and so many ‘developments’ that should have been nipped in the bud, are not. Also beneficial new ideas, that might have come from a forced re-think, are doomed to wither on the tree. So carry on with the good work! Perhaps the answer to the question “How many spatial dimensions does VS have—two, three, four or five?” may be—any of them under particular circumstances. !. What Schilder calls the ‘primitive’ VF (e.g. the Ganzfeld and the black VF in the dark) seems to have 2D (even if set back a little from “O”). Furthermore, in the case of certain brain lesions, the VF with open eyes is reduced to completely flat 2D. Gordon Holmes (1919) reported such a case. 2. The VF we experience normally when our eyes are open seems to have 3D (although to whether the extra dimension of visual depths is provided by an extension of real space, or by a sort of trompe l’oeil effect, seems uncertain. Moreover, John Lilly reported that in sensory deprivation experiments the 2D VF in the dark can open up to form a 3D “room”. Inner space and its contents can be very impressive! 4. Thomas has given us a very clear account of Jean-Pierre Jourdan’s theory that NDE’s involve a fifth dimension of VS (in the “Structural Isomorphism” blog). Bernard Carr has suggested that VS consists of a hierarchy of VSs, all of which are cross-sections of his n-dimensional “Universal Structure”. Therefore, I suggest, when discussing the dimensionality of VS we need to specify what context we are using. I will try to make at least a partial reply to Bill's comment concerning the issue of synthesizing concepts from different fields in constructing the geometry of visual space. A key concept in my construction is the depth function Eq 1 and its transform Eq 4. Eq 4 gives a transformation on a sphere to account for the tendency towards size and shape constancies (and hence also for closeup distortion), and the result is an external geometry of visual space from a three dimensional point of view (i. e., the transform of the depth function is still not located in visual space per se). The result can also be described by an internal geometry, where the coordinate system is embedded in the two dimensional visual space per se, which I hold thus holds a dynamic in time variable curvature. I derive this internal geometry in my NOUS paper that I refer to. I agree with John that context is important in these discussions, and that there may very well be people who completely lack phenomenal depth perception. I don't think that this results in a change of dimensionality of the experience though, but rather that the constant 'a' of the depth function transform Eq 4 would then be 0. Correction - I should be looking at my own equations before posting these notes. In Eq 4, when there is no phenomenal depth perception occurring, I want 0 to be subtracted from C so a would have to be infinity. Also, the whole transformation here undoubtedly needs to be more complicated to take into accounts things such as conflicting physical depth cues. Responding to the interesting report from Gordon Holmes' patient that John relates, the patient seems to describe a condition not even present in normal monocular vision. Most single-sighted individuals who have lost binocular vision complain of losing "depth perception." But Holmes' patient seems to have lost something in addition to that, namely, the ability to "understand" perspective, and is aware of that, explicitly complaining of the "flatness" of objects, something that single-sighted people do not, perhaps because of knowing that monocular parallax provides good depth cues. If someone does not think to move sideways to see depth, one important depth "cue" is missing. This suggests that "seeing perspective" as 3-D may require experience with binocular vision *first* in order to "understand" it as a "representation" of 3-D space. With Holmes' patient it sounds like he "lost" that experience, or his access to it, and found himself vis-a-visa a VS that even he saw as being other than just normal monocular VS.
John, does Holmes specify the patient's neurological condition? Peeling back the layers of judgment (including the whole awareness of monocular "cues" which apparently can be obliterated as in Holmes' patient) may serve to illuminate the primal VS (no pun intended), which is more fundamental than any notions of dimensionality. One problem I see is a lack of consistency in the criteria of defining dimensionality. Bidimensionality seems to be a "given" but when it comes to even the third dimension (let alone higher ones), we seem to swap horses in midstream, with reference to perspective, etc. This is not done in physics which treats the dimensions of physical space-time as being homogeneous and isotropic. In response to Bob's analysis, for example, physics does not embed space-time in a higher dimensional manifold in order to define its dimensionality. Part of the problem comes back to the role of the observer in perceptual space, because the position of the observer simultaneously defines the perspective projection (if one superimposes on VS the "mechanism" of perspective projection, with its pencil of lines and plane of projection) and, in a sense, the third dimension as extending away from the observer, unlike the other two dimensions which are ordinarily thought of as being perpendicular to the observer. Then bringing in higher spatial dimensions seems to transcend perceptual space and its observer altogether, because perceptual space is certainly not more than tridimensional by any observable criteria. Ganzheit psychology had its own definition of a Gestalt "depth dimension" which was construed as something "inner," and related to experiences being "deep," but deriving from the sense of "depth" as in "deep feelings." There needs to be a systematic way of sorting all of this out, and thus far, I don't see that there is one, partly because no one has analyzed (at least throughly) how our ideas of geometry and dimensionality came about on the basis of perceptual space. As a comparison, the physicist or cosmologist would explain objects remaining the same size and shape on the basis of the strong force (nuclear force) rather than the weak force (gravitation) responsible for the curvature of space. But in your geometrization of VS, Bob, you do not state any putative visual source for the transform in Eq. 4. Does it make sense to ask the question of whether size/shape constancy actually changes the shape (e.g., putative curvature) of VS? Once again, my impression is that geometrizing VS involves a quite different approach than that of geometrizing physical space (viz. "physical geometry" and geometrodynamics), and I wonder why this is the case? It seems to me that the internal geometry of VS should, in some sense, be accomplished before embedding it in a space of higher dimensionality, whether 3, 4, or more dimensions. Many years ago I conducted an experimental study to investigate whether or not visual images possessed stereopsis. My paper was entitled "Is the Engram a Stereogram?" The method was to show Ss a randomized series of photographs featuring both stereoscopic and non-stereoscopic photos (the Ss wore polaroid glasses in viewing the photos, which were projected on specially prepared slide projectors). A follow up session had them make two selections: (1) whether they had seen the photo before and, if so, (2) whether it was stereo or not. All Ss scored very highly in their ability to recognize photos that they had previously seen (as was predicted by the photo recognition literature). 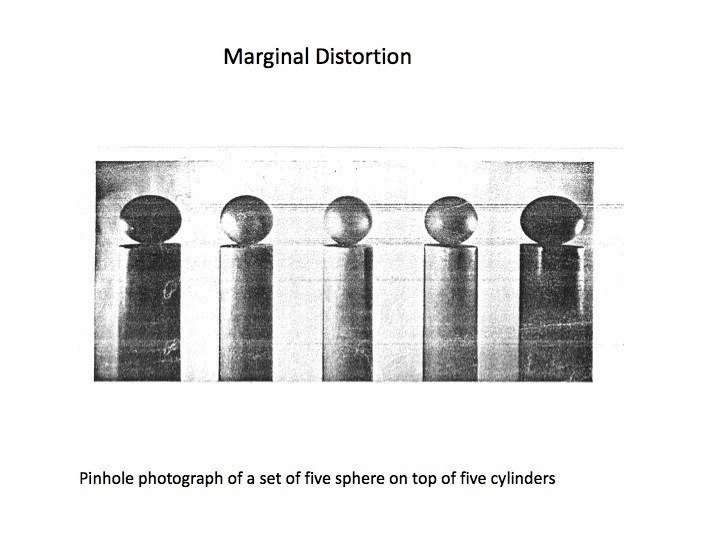 They also scored quite well on whether a photo they had previously seen was stereo or not, yet when questioned after the experiment, most only could recall separate "depth planes," but could not really visualize a stereo image of a given photo they had seen in stereo. They would, for example, remember that a photo had been stereo because the "tree limb stuck out from the tree," or some such--they remembered that a distinctive figural feature, which could be described in figure/ground terms. My conclusion was that the visual system processes stereo percepts into monocular ones, by breaking them into figure and ground (Gestalt), not by storing them in a stereoscopic form. I referred to this in terms of a fractional dimension as "2 1/2 dimensional," only discovering subsequently that Steven Pinker suggested that the visual system creates first a 2 1/2 dimensional "sketch" as a visual representation. But it suggests that the visual system is able to convert binocular visual data into monocular visual data for purposes of memory. No doubt John would see this as being consistent with information compression technology. Again,I will make just a partial reply. The dimension theory I am using is a well developed one, originally given by Poincare, and is well stated by Karl Menger in the reference that I give. It can certainly be applied to the third dimension of physical objects, since a two dimensional spherical surface can bound a three dimensional volume, although I really don't know what to say about the case of space time. The tendencies towards size and shape constancy do apply to phenomenal visual space per se, and not just to the external geometry, and one way to get at them is to compare the visual experiences with a photograph of the same scene from the same vantage point. I think that the transform which I put on the depth function is at least roughly right here since it does result in the right direction for deviations in size and shape from a projection onto a sphere, but it is hard to say anything precise here due to individual differences, conflicting depth cues etc. I know Steven Pinker, and discussed these matters with him years ago, but I believe that it is David Marr who originally came up with the 2 1/2 D sketch. Of course a formal geometrical solution is only part of the problem. Einstein was concerned that the elegance of mathematics might tend to obscure the underlying physical reality he sought to elucidate, and the contribution of mathematical psychology to understanding the human mind seems to have yielded not one major insight or theory. It is the same with VS: If we have a metric that explains why we don't see projective "distortions" that can be seen in photographs, how far does that really get us? Is the claim that the curvature of VS reflects the curvature of the retinas or not? The trouble with cog sci in general (largely thanks to the influence of A.I.) is that it has generated a mountain of formal solutions of how the mind and brain "might" work but, to echo the words of Crick, we want to know how Nature does it, not how it might be done. A projection onto the spherical retina would avoid marginal distortions, but as far as I can see a variable curvature, such as the one I sketch, is necessary in order to also avoid closeup distortions. Bill, if you are referring to Marr's work with his 2 1/2D sketch with your remarks about cognitive science and artificial intelligence, I do think that my depth function is very similar to what he is talking about. The closest that I know to anything in the brain doing anything like this is with the neurons in the visual cortex that are sensitive to specific retinal disparities. If you, or anyone else, knows more that is of relevance on this subject I would be interested in hearing about it. Invoking variable curvature in order to avoid closeup distortions might imply that there is a picture editor in the brain, who fixes closeup distortions by comparing the perspective projection coming from the retinas with another image that does not have distortions. But both the vision editor (homunculus) and the comparison he would make are not occurring because they are logically impossible. I was not specifically alluding to Marr with my remarks, but I do have a problem with his notion of a "primal sketch." Just what is the sketch of? Though the fovea is only 01.00 mm. in diameter, its cortical representation is proportinately much larger than the surrounding retinal area. This poses a size problem for VS, because on the basis of congruence, one would expect that every time we foveated something, it would suddenly loom in size and appear much larger, then just as suddenly shrink as we foveated away from it. I don't think that a homunculus is involved here Bill, at least if this involves anything like a little man, since regresses occur then. Some sort of matching between information from the two retinas is necessary for stereopsis though, and clearly the brain in some way is doing this because we know that there are neurons in the visual cortex which are sensitive to specific retinal disparities. Also, it clearly is possible to "fool the system" in the case of random dot stereograms. As far as your point about foveal regions being disproportionately enlarged in the visual cortex, I think that this does show that there is not a metrical isomorphism there with events in visual space, but at most a topologic isomorphism of close points to close points. While I am not at all convinced that events in the visual cortex are the immediate neural correlates of visual experiences, one possible move here would be to say that the causal connection is selective (based on some criterion, such as frequency of neural firings or possibly something quite different), and thus that the connection is just with certain neurons which may be spaced at different distances apart. However, as I have said several times before, I really don't think that we have a good handle on what is going on yet, and thus at most we can just explore the implications of various hypotheses here. The trouble with homunculi is that they are not always recognized as such when they are as it were in cognito as "functions" or, say, "computations" (pace, John). This was the pitfall of the old psychology of "faculties" and also with its descendant phrenology, as duly critiqued by Lange and James in the late 19th century. Every time something like a homunculus seems needed it is red flag that one is going in circles. That suggests a basic defect in the reasoning that leads to homunculi, and that defect as much as anything needs to be identified and defined, indeed by philosophers. Dennett's solution of decomposing intelligence by making more and more "stupid" homunculi in the brain seems a non-starter IMO. I think we should adopt a highly critical (and even skeptical) attitude towards all general or tacit theory in visual neuroscience, and perhaps even for now assume Newton's position of "hypothesis non fingo" and see where the facts alone take us, with as little interpretation as possible. Fortunately in the case of so-called "binocular cells" in V1, called that because they seem to selectively respond to specific depth planes (or, as you say, are ostensively sensitive to retinal disparities), no homunculur comparison is involved, because the comparison has already been done by Nature in giving us those cells at birth (yes, I seem to be making a homunculus out of Nature, what?) But whether and how those cells are involved in the stereopsis we experience is another matter. Going against my own suggested mandate above ("non fingo"), it is hard to escape the impression that the construction of VS is being simultaneously being determined from both ends of the system, as if the light and brain, respectively, form a relatively closed causal subsystem, in which VS comes about through a process more akin to "tuning" or "resolution" than by the ostensive analytical process that Hubel and Wiesel characterized in the course of their research, which may serve other purposes. I am not always a bit fan of Dennett, particularly concerning what he has to say about consciousness, but I thought his point in talking about stupid homunculi is that they can both be described with what he calls the "intentional stance," but also under what he calls the "physical stance." The point is that the physical stance can actually be cashed out in terms of something that can be built, with various logic gates etc., in which case there is no regress to worry about. What Dennett fails to see (apparently) is that any homunculus is a problem, even a stupid one. We still come back to "how Nature does it," as Crick said, not how a cognitive scientist might simulate perceptual processes to produce some predetermined result. The literature abounds with such models, which for the most part, don't seem to be much help, otherwise vision would have been "solved" long before now--especially conscious vision. I think that we are beginning to get off the topic of this particular section of the blog, Bill, so it might be better to set up a new section on the topic. I take it that you think that there is something unbiological about Marr's primal sketch, and perhaps about modeling the brain as a type of computer in general. There are obviously many dimensions of issues here (e. g., being carbon vs. silicon based, serial vs. parallel processing, digital vs. analog, etc.) but the concept of a computer is also very versatile throughout. Thus, perhaps it would help if you would say either what exactly it is that you object to either with Marr specifically or the computer metaphor in general. What Crick was replying to was someone in a colloquium describing a model they had formulated for pattern recognition. When Crick objected to it because of all its assumptions about neurophysiological functioning that had not been established empirically, the man exclaimed, "But Professor Crick, the model is pretty and it works!" To that Crick retorted, "That's the criteria if one is trying to sell a vacuum cleaner!" In short, as I should have thought was obvious from my previous remarks, no one has proven that the brain is involved in computation, let alone that it is a computer. That is the whole topic of Raymond Tallis's exposé to which I have now referred several times and quoted. If the brain is a computer, then why not the heart, stomach, or kidneys, or any other organ in the body? It is not at all obvious that "computation" is something that one can assume occurs naturally. The burden of proof really lies on those who claim that the brain is a computer and that it is computing. That basic fact has never been established, and much theory has proceeded on the tacit assumption (presumably) that it is self evident. As I asked before, what is Marr's primal sketch supposed to be of? This should no doubt appeal to John because the researchers invoke mental processes occurring as a "continuous trajectory through a higher dimensional space"--albeit a mathematical space. I should add that this study was only one in over 40,000 "hits" in a Google search of the phrase "brain is not a computer," so this view is by no means just heresy at this point. Neurologist Gerard Edelman at Rockefeller has been one of the most outspoken in taking that stand with his own theory of consciousness. But Bob is right, this is really a topic for a separate thread. I agree Bill lets get another thread going on these topics. I did take another look at Marr's book "Vision" where he gives a several stage account of human vision starting with retinal images with a goal of three-dimensional object recognition. The closest that he comes to defining "sketch" seems to be "Both the primal sketch and the 2 1/2 D sketch are constructed in a viewer-centered coordinate frame, and this is the aspect of their structures denoted by the term sketch." I don't see that he specifically addresses the issue of the object of the sketch (perhaps "stage" would have been a better word), and the primal sketch is construed as an intermediate stage of visual processing just prior to stereopsis and the resulting construction of the 2 1/2 D sketch. I like the idea of the 2 1/2 D sketch since I believe that it is at this stage of processing that the neural correlates of visual experiences occur, although Marr does not address this issue. With respect to whether the brain is a computer, I actually have no strong axes to grind, and I think a lot depends on how "computer" is defined. I think a fairly innocuous sense may involve Dennett's concept of the intentional stance, which certainly is meant to be devoid of any anthropormorphic implications of a programmer etc. But lets start a new section on this topic if we are going to continue it. Of course my question about Marr's "sketch" was partly rhetorical because I know that he does not define it very adequately, and that it is just another metaphor. But "sketch" used in this way is usually a means to an end, either for a painting, or some other form in the pictorial arts. The problem is that a person does the sketching, and the sketching is either based on something seen or imagined, but in either case, the artist can compare the sketch with the original (in the case of, say, a still life sketch) or with one's mental image. The visual system is unable to do make that sort of comparison. Going through my old reprints yesterday (and we really should collaborate on a bibliography for our blog), I came across the Helmholtz checkerboard which, to my way of thinking, still is in need of an interpretation that does not involve contradictory definitions of straightness. It is particularly relevant here because it requires fixating the center of the figure, thus controlling for eye movements, yet it is clear that the shapes of the outer squares in the checkerboard are "recitified"--literally, so that the appear or give the impression of being right angles with straight sides. I am not convinced that a curved space is what is required to explain that, though. Rather than belaboring the computer/computational analogy further at this point, I would like to suggest that it might prove useful to ponder Hubel & Wiesel's remarks that I quoted for a new posting, and their possible significance for our topic. I had occasion to to study an old LP album cover and had the distinct impression as I looked at it "squarely" of barrel distortion, and as I scanned it from corner to corner, was convinced that with age the album had become warped (of course that would not have bowed the edges of the record jacket!) What did I spontaneously do? I held the album sideways to see if it was bent, and it appeared straight, so clearly it was not warped. So my final visual impression overruled my first visual impression, i.e., the perception of the LP from the side as a thin apparently (visually) straight edge satisfied me that the album was in fact not buckled or bowed, but had to be flat, and was therefore square. But this conclusion reflected a process of logical inference, not perception alone. It is closer to how Gibson conceived perception as a process unfolding over time than as a series of static snapshots. I believe this speaks to the idea, though, of visual geometry being in some sense "dynamic" rather than constant, or at least that we somehow correct for possible baseline (positive) curvature coming from the retinal projections through sampling line segments/edges by moving our eyes along them--but not their whole length, often only to corners or edges. Previously here I have called this "rectification," which I think is a good word for it in more senses than one!